It being day 5 of the London Games already I am, of course, being visited by a crushing black dog depression which left me completely apathetic about watching or writing about any form of sporting endeavour. Of course, there was an inevitability that this would also be the day that Team GB won their first gold medals of the competition. Coincidence? Who knows. But if it isn't, there's every chance that when the Velodrome opens tomorrow it could be a portent of my suicide. Medals have been much in the thoughts and minds of Olympic commentators today. Last night the American swimmist Michael Phelps won his 19th Olympic medal, an all-time record for any competitor in any sport. Today, of course, saw Bradley "Wiggo" Wiggins win his seventh Olympic medal and becoming the most decorated British Olympian ever. Much wiffling about Greatness ensued. 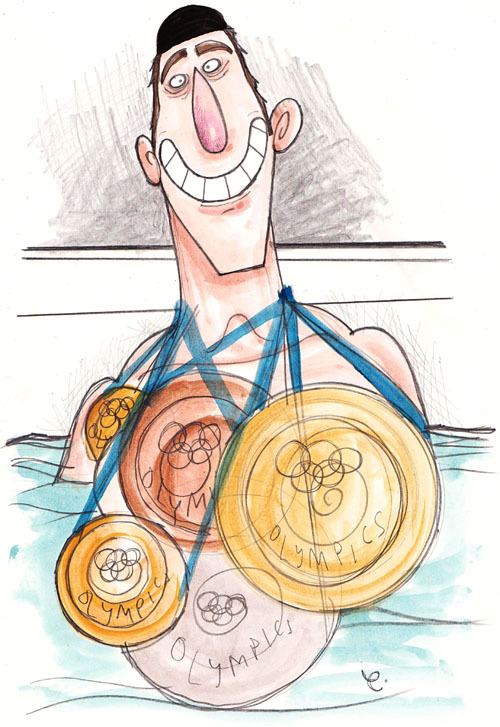 Is Michael Phelps the greatest ever Olympian? Is Bradley Wiggins the greatest ever British Olympian? Well, that depends. What is the outstanding factor of a great Olympian? If it is medal count, then its obviously a no-brainer. However, the Olympics is more about people than it is sport. For me the greatest Olympian is the one who inspires the most people, not just to do sport but in their day-to-day lives. If Phelps or Wiggins manage to do this of course, then the more power to them. But I think both men still have some way to go to match Eric "The Eel" Moussambani of Equatorial Guinea. And I'm not even kidding.